Not to be confused with Malankara Orthodox Syrian Church. Under the Holy Apostolic See of Antioch & All East. The Jacobite Syrian Christian Church also known as the Malankara Jacobite Syrian Christian Church, the Malankara Jacobite Syrian Orthodox Church, or the Syriac Orthodox Church of India, is an autonomous Oriental Orthodox Church based in the Indian state of Kerala, and is an integral branch of the Syriac Orthodox Church of Antioch. It recognizes the Syriac Orthodox Patriarch Of Antioch and all the East, currently Moran Mor Ignatius Aphrem II seated in the Cathedral of Saint George, Bab Tuma, Damascus, Syria, as its Supreme Head. It functions as a largely autonomous unit within the church, under the authority of the Catholicos of India, currently Aboon Mor Baselios Thomas I. Currently, this is the only church in Malankara which has a direct relationship with the Syriac Christians of Antioch, which has continued from after the schism and they continue to use West Syriac Rite. It is believed that Saint Thomas Christians of Malabar were in communion with the Church of the East from 295 to 1599. 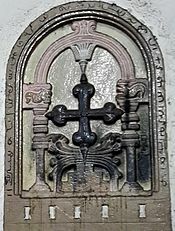 They received episcopal support from Persian bishops, who traveled to Kerala in merchant ships along the spice route, while the local leader of the Saint Thomas Christians held the rank of Archdeacon; it was a hereditary office held by the Pakalomattam family. In the 16th century, the overtures of the Portuguese padroado to bring the Saint Thomas Christians into Latin Rite Catholicism led to the first of several rifts in the community due to Portuguese colonialists, and the establishment of the Catholic and the Malankara Church factions. Since then, further splits have occurred, and the Saint Thomas Christians are now divided into several factions. Saint Thomas Christians were administratively under the single native dynastic leadership of an Archdeacon (a native ecclesiastical head with spiritual and temporal powers, deriving from Greek term arkhidiākonos) and were in communion with the Church of the East, centered in Persia, from at least 496. The indigenous Church of Malabar/Malankara followed the faith and traditions handed over by the Apostle St. Thomas. During the 16th century, the Portuguese Jesuits began deliberate attempts to annex the native Christians to the Catholic Church, and in 1599 they succeeded through the Synod of Diamper. Resentment against these forceful measures led the majority of the community under the Archdeacon Thomas to swear an oath never to submit to the Portuguese, known as the Coonan Cross Oath, in 1653. The Malankara Church consolidated under Mar Thoma I welcomed Gregorios Abdal Jaleel, who regularized the canonical ordination of Mar Thoma as a bishop. Meanwhile, the Dutch East India Company defeated the Portuguese and gained supremacy over the spice trade in Malabar in 1663. The Malankara church used this opportunity to escape from Catholic persecution with the Dutch East India Company's help. At the request of the Malankara Church, the Dutch brought Gregorios Abdal Jaleel of Jerusalem, a bishop of the Syriac Orthodox Church, in their trading vessel in 1665. Mar Thoma I forged a relationship with the Syriac Orthodox Church and gradually adopted West Syriac liturgy and practices. The church lost its legal status as the Malankara church and thereby the ownership of several churches, in a historic verdict of the Supreme court of India which put an end to decades of litigations and disputes that surrounded the Jacobite Syrian Church and Malankara Orthodox Syrian Church . As part of the Syriac Orthodox communion, the church uses the West Syriac liturgy and is part of the Oriental Orthodox group of churches. It has dioceses in most parts of India as well as in the United States, Canada, the United Kingdom, Western Europe, the Persian Gulf, Australia and New Zealand nations. In 2003 it was estimated that the church has 1,200,000 members globally. This Church uses the Peshitta, Vishudhagrandham, translated by Arch-corepiscopos Curien Kaniamparambil, as its scripture. Puthencruz is the headquarters of the Malankara Jacobite Syrian orthodox Church in India. Its headquarters is named after the illustrious Patriarch of Antioch Ignatius Zakka I Iwas. The property was bought and built under the leadership of the Catholicos of India Baselios Thomas I, after the church faced difficulties in continuing its functioning from its base at Muvattupuzha with the demise of Catholicos Baselios Paulose II. JSC Publications, The official publishing house of the church are also a part of the large complex. Malankara Jacobite Syrian Sunday School Association (MJSSA) is also based in Puthencruz. St.Thomas College Arts and Science is also run in the premises of the Zakka centre. Michael Mor Dionysius(M.D) Book Stall, official book house of Jacobite Syrian Christian Church. This is the place where Universal Malankara Convention, the official gospel convention of the community, that is generally conducted from 26 to 31 December of every year. For the current Catholicos of India, see Catholicos Baselios Thomas I.
Catholicos of India is an ecclesiastical office in the Syriac Orthodox Church, the head of the Jacobite Syrian Christian Church in Kerala, India. He is the Catholicos/Maphrian of the Jacobite Syrian Christian Church an autonomous body within the Syriac Orthodox Church, and functions at an ecclesiastical rank second to the Syriac Orthodox Patriarch of Antioch. The jurisdiction of the Syriac Orthodox Catholicos is limited to India and Indian diaspora. The Catholicos of India position was created in 20th century in Syriac Orthodox Church, amid a series of splits within the local Malankara Church and the broader Syriac Orthodox communion that divided the community into rival Malankara Orthodox (pro-autocephalous) faction and Jacobite (patriarchal) pro-autonomous faction. It was instituted to provide a regional head for Jacobite Syrian Church, the faction that remained closely aligned with the Patriarch of Antioch. The position had remained vacant between 1996 (date of death of Catholicos Baselios Paulose II) and 2002. The current Catholicos of India is Baselios Thomas I. He was enthroned as the Catholicos by Ignatius Zakka I Iwas, in a ceremony held in Damascus, Syria on 26 July 2002. He is the second Indian Maphrian and Catholicos of the Syriac Orthodox Church in India and Metropolitan Trustee of the Jacobite Syrian Christian Church. There are dioceses under the jurisdiction of the Patriarch of Antioch. ^ "Malankara Jacobite syrian Sunday School Association". mjssa.in. 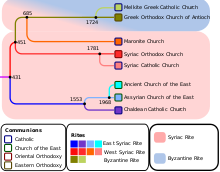 ^ "Syriac Orthodox (Jacobite) Churches in India". www.syriacchristianity.info. ^ Society, Canadian Anthropology (2004). Anthropologica. Canadian Anthropology Society. ^ Courier, Madras (25 December 2017). "How Christianity Arrived In Kerala Through Syrian Immigrants". Madras Courier. ^ "JSC News - The Official News Portal of the Holy Jacobite Syrian Christian Church". ^ "Pastoral message of H.B Thomas I, Catholicos of India, Jacobite Church Head in India". ^ "Jacobite Syrian Christian Church Constitution 2002 (in Malayalam)" (PDF). ^ Russell, Thomas Arthur; Comparative Christianity: A Student's Guide to a Religion and Its Diverse Traditions(English) Boca Raton, Florida;2010; Universal Publishers; p 40. ^ Gregorios; Paulos; Roberson; Ronald G.; The Encyclopedia Of Christianity Online (Syrian Orthodox Churches in India)(English) Netherlands;2016; Brill Online Reference works. ^ Lucian N. Leustean; Eastern Christianity and the cold war, 1945-91(English) New York;2010; Routeledge Taylor&Francis Group; p.317. ^ Erwin Fahlbusch; The Encyclopedia of Christianity, Volume 5(English);2008; Wm. B. Eerdmans Publishing;p. 285. ^ Frykenberg, Eric; Christianity in India: From Beginnings to the Present(English); Oxford University Press; p 374. ^ "The Malankara Syriac Church – SCOOCH". www.scooch.org. ^ "Metropolitan's from the Syriac Orthodox Church of India Visits Patriarch Ignatius Aphrem II". 21 October 2016. ^ Alexander 2018, p. 56. ^ "Saint Thomas Christians- Chronological Events from First Century to Twenty First Century". Nasranis. ^ Thomas, Abraham Vazhayil (1974). Christians in Secular India. Fairleigh Dickinson Univ Press. ISBN 9780838610213. ^ Joseph, John. Muslim-Christian Relations and Inter-Christian Rivalries in the Middle East: The Case of the Jacobites in an Age of Transition. SUNY Press. ISBN 9781438408064. ^ "CATHOLIC ENCYCLOPEDIA: St. Thomas Christians". www.newadvent.org. ^ Fahlbusch, Erwin; Lochman, Jan Milic; Mbiti, John S.; Vischer, Lukas; Bromiley, Geoffrey William (2003). The Encyclopedia Of Christianity (Encyclopedia of Christianity) Volume 5. Wm. B. Eerdmans Publishing Company. pp. 285–286. ISBN 0-8028-2417-X. ^ "St. Athanasius Cathedral, Puthencuriz". www.syriacchristianity.info. ^ Administrator, Site. "St.Thomas College". stcpcz.in. ^ "Catholicate of the East". catholicose.org. ^ "Kollam Diocese of Jacobite Syrian Church". Retrieved 5 March 2015. ^ "Official site of Thumpamon Diocese". Thumpamon Diocese. Retrieved 5 March 2015. ^ "Niranam Diocese of Jacobite Syrian Christian Church". Niranam Diocese. Retrieved 26 September 2017. ^ "Kottayam Diocese". Kottayam Diocese. Retrieved 26 September 2017. ^ "Official website of Idukki Dioces". Retrieved 26 September 2017. ^ "Kandanad Diocese - Jacobite Syrian Christian Church". Kandanad Diocese. Retrieved 26 September 2017. ^ Kochi Diocese of Jacobite Syrian Church Retrieved 26 September 2017. ^ "Malankara Jacobite Syrian Orthodox Church". Thrissur Diocese. Retrieved 26 September 2017. ^ "Kozhikode Diocese - Jacobite Syrian Christian Church". Kozhikode Diocese. Retrieved 26 September 2017. ^ "Official Website of Malabar Diocese, Jacobite Syrian Christian Church". Malabar Diocese. Retrieved 26 September 2017. ^ "Mylapore Diocese - Diocese of Jacobite Syrian Christian Church". Mylapore Diocese. Retrieved 26 September 2017. ^ "Delhi Diocese of Jacobite Syrian Church". Delhi Diocese. Retrieved 26 September 2017. ^ "Honnavar Mission". Retrieved 26 September 2017. ^ "Evangelical Association of the East". Retrieved 26 September 2017. Alexander, George (2018). The Orthodox Dilemma (3rd rev. ed.). OCP Publications. This page was last edited on 7 April 2019, at 12:46 (UTC).